With Autodesk’s acquisition of Creative Market earlier this year, a platform that allows creatives and developers to sell everything from photos, graphics to even Photoshop plugins and brushes, Adobe’s action would be to fall back on one of its acquisitions, the Behance site, to launch its Creative Cloud Content which is described as “collection of high-quality, curated assets for creatives by creatives.” If you are a Creative Cloud subscriber, you can access thousands of free items via your Adobe Creative Cloud desktop app but not directly via Photoshop. But there are a few things that Adobe didn’t mention. Were the content providers included paid in any way? 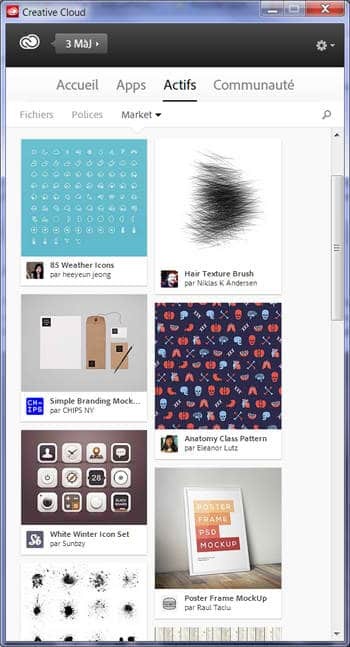 How about if you’re a Behance user interested in submitting your work? Also, while the iOS and browser-based version of Creative Market are coming along, there is no mention of an Android version. All of these seem like a panic response to Autodesk’s Creative Market. Right now, Adobe’s Creative Market is providing everything for free but who knows how long until it shifts to commercial content. Adobe is still silent as to what its next step would be. We’ll just have to see if Adobe will succeed as a market of royalty free content for creatives. There are currently four contests running at Fotolia that will challenge your creativity and will give you a chance to win fantastic prizes. German photographer Paul Ripke and British digital illustrator Nik Ainley teamed up for the third instalment of Fotolia TEN Collection Season 3. Graphic designers and photographers, both amateur and professional, are encouraged to challenge Paul and Nik in both or either discipline. Entering is simple. To challenge Paul, take a photo based on the theme “Sports in the Future”. If you want to challenge Nik, create a PSD file based on the same theme. Watch this video tutorial for creative tips from the artists themselves. The creativity doesn’t end there because the Fotolia Instant App contest is still ongoing. 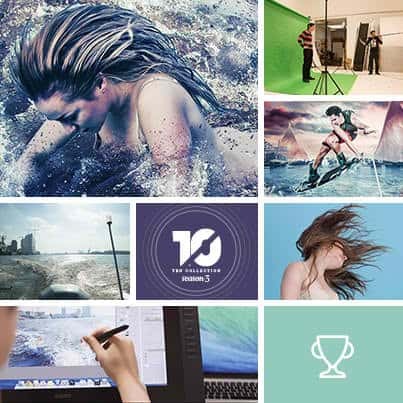 To mark the launch of the Android App two weeks ago, Fotolia updated their contest and is now offering a $5000 prize for the Android user whose image makes the most sales until December 31, 2014. This is in addition to the $5000 already up for grabs for iPhone Instant App users. 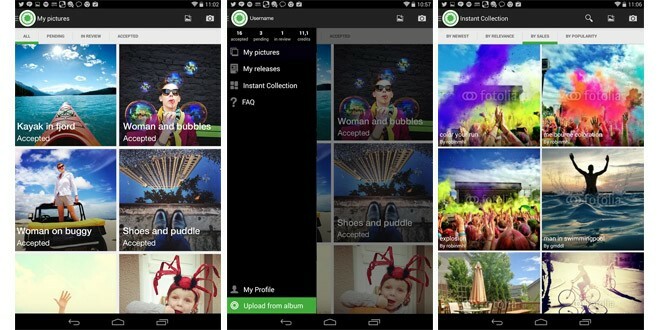 To enter, just download the app (iOS or Android) and start uploading your images. 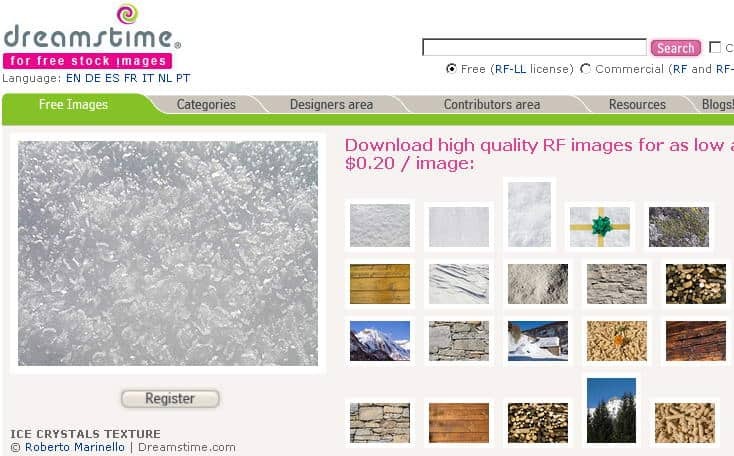 For more information, check the Fotolia Instant Contest Information page. Shutterstock will announce its financial results for the second quarter ended June 30, 2014 on August 7, 2014, Thursday after the market close. The stock agency will host a conference call at 5:00 PM ET that day and it can be accessed at (866) 318-8617 or (617) 399-5136 (International), conference ID# 52771187. It will also be broadcast simultaneously at http://investor.shutterstock.com and a replay of the webcast will be available on Shutterstock’s website. For more information, head on to investor.shutterstock.com. Upload and download model and property releases made easy directly whilst editing your content. Editorials do not require a release. Once curated by our team, content is available for sale. Content uploaded will automatically generate smaller resolutions. You can easily change your prices for every resolution generated to help you sell. 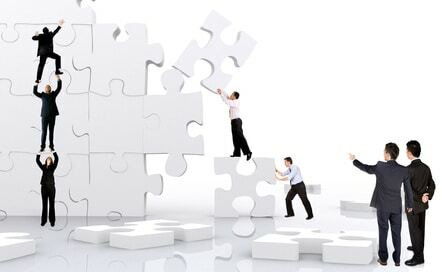 You can interact on every piece of content uploaded, connect with buyers and other professional content providers. As of now, the site is still in developing stages and more features will be added soon, however, UltimatStock welcomes users to upload and test the platform at this early to be able to pinpoint and address certain site issues. Stockperformer is happy to announce their newest feature: The Yearly Dashboard wherein users’ yearly reports are now available all the time. The new dashboard is designed to answer questions you had regarding your yearly performances. Compare Years: Are you doing better this year than last year? Plus, they added cool new charts, too. The new type of chart: the Horizontal Bar Chart displays the relationships between various categories and sales breakdowns. Since it is easy to read, you’ll be seeing it in many different places in Stockperformer soon. Do you want to know how 2013 is doing compared to 2013? Then here’s the added option in Stockperformer to compare years. Just use the pull down menu and select a year to compare to. The compare years option displays the current 2014 month sales compared to 2013. And you cannot just compare total values but also comparison values in the Sales Breakdown Charts. 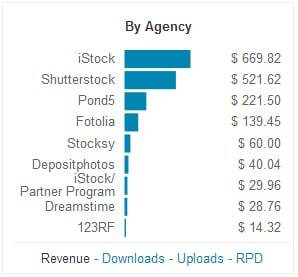 In the image below, you’ll see a revenue comparison by agency between 2013 and 2012. To launch you Yearly Dashboard, go to your main Overview and click on “Year to date.” Your dashboard contains summarized data and one section for each agency with sales breakdowns relevant to that agency. Go ahead and see what you can discover with your new Yearly Dashboard. If you’re not a member, sign up here, the first month’s free! iStock recently introduced a new subscriptions program where customers can buy subscription packages and download set of images per month. 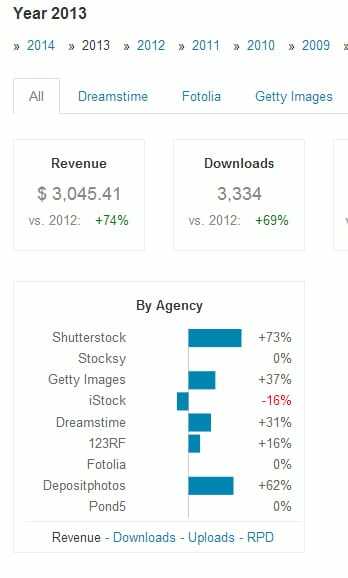 However, iStock does not report daily sales and daily breakdown of the sales. Worry not because Stockperformer has the answer. They have now added a support for iStock subscription sales and you can download it by clicking on the iStock Subscriptions button on the left menu. You can also see a specific month’s daily breakdown of Subscription sales. When you click on any day, it will bring up the Daily view will all sales on that day. 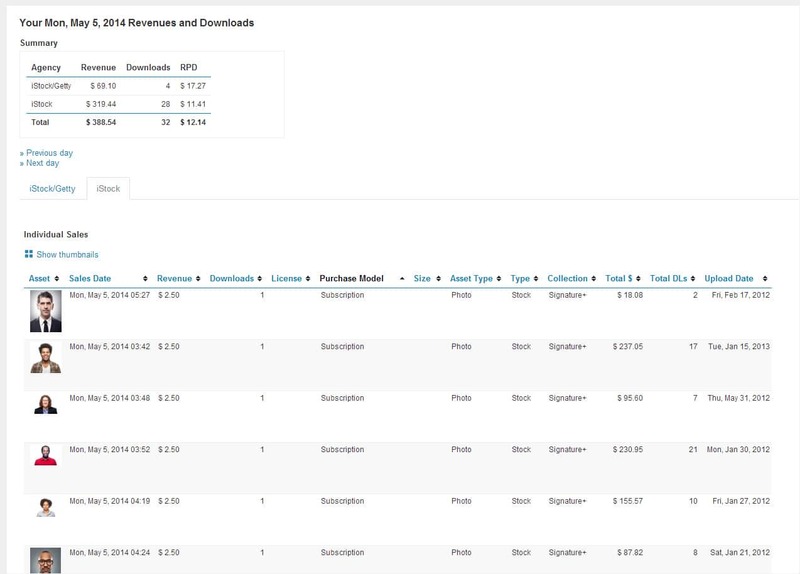 Also, sorting the table by Purchase Model will bring your subscription to the top. If you have any questions or need assistance, you can visit www.stockperformer.com.